Nice review for Discovering the Boston Harbor Islands at BostonZest (unfortunately, our book event on Georges Island mentioned in the post got rained out this weekend). If you live in Weymouth and are looking to learn more about the islands that are right in your backyard, Weymouth community television is now airing a 30-minute show that I had the pleasure to host. Check here for any future broadcasts. By the way, there are upcoming book events in October at the Hingham Library, Borders in the Back Bay of Boston, and the Harvard Coop. Details here. I got a chance yesterday to visit the recently opened Bleacher Bar on Lansdowne Street. The great thing about this bar is that it has a view directly out onto center field of Fenway Park. The large garage door in center field has been converted into a window that allows bar patrons to spy on the doings inside Fenway. Like Fenway itself, the Bleacher Bar has a highly irregular shape; it's shape is similar to a right triangle with the bar itself on the angled side. So not all tables have a view of the field, but those that do are highly coveted. It's also possible in some parts of the bar to stand and see the field. Before the gates open up at Fenway, the Bleacher Bar is a great place to get a beer because you can catch the Red Sox starting their batting practice. You can also watch the action during the game from inside the bar as well, but I believe there is a time limit on the tables that have field views. Shutterbugs take note that there is no flash photography allowed during batting practice and games. The walls are adorned with memorabilia and there are montages honoring Sox greats who have had their numbers retired. The retired numbers are also carved in the wood along the length of the bar. The beer prices were actually slightly cheaper than the Cask n Flagon as well ($10 for a Heineken and 16 oz Bud Light vs. $10.25). If Dice-K is pitching, you may want to have a Sapporo to get in the spirit; food is available as well. There was an interesting article in Wednesday's edition of The Boston Globe about a new ferry service that will be launched next years from Squantum Point Park in Quincy. According to the article, the ferry will run to the Boston Harbor Islands, John F. Kennedy Library, Adams National Historical Park, and Cape Cod National Seashore. I'm guessing that's a separate ferry to go all the way out to Cape Cod, and I'm not quite sure how a ferry is going to get people to Adams National Historical Park since it's not along the water. With a ferry to the Boston Harbor Islands leaving from Squantum Point Park, the plan is to shift the ferry service away from the Fore River Shipyard, where it's been for a few years. One advantage of the new location is that it's adjacent to Marina Bay, which has a number of restaurants at which to grab a bite to eat after a day of exploration. Another is that transit time to the islands would be cut almost in half to 13 minutes. I'm all for more ferry service in and around Boston Harbor. I think it's a tremendously underutilized resource. If you've ever been fortunate enough to visit Sydney, Australia, and see the constant flow of ferries coming in and out of Circular Quay, you'll appreciate a city that has taken advantage of its blessed harbor. Hopefully, this will increase visitation and help generate money to help with some badly needed projects on the islands: an upgrade to the dock at Georges Island, the reopening of Gallops Island, the renovation of Fort Andrews on Peddocks Island into an eco-camp, etc., etc. Squantum Point Park has some history in its own right as the former site of the Squantum Airfield. The decrepit runways are still there and are flanked with stone markers explaining some of the historical aviation events that took place there such as the Harvard-Boston Aero Meet of 1910, which marked the first time that most Bostonians saw these strange "flying machines" known as airplanes. I recently heard about some great boat tours of Boston Harbor and the islands that are run by the Marine Operations at UMass-Boston. There are tours of both Spectacle and Thompson Islands, although this late in the summer, the only island tour left is Spectacle on September 18. The cost is $5 for those with a UMass ID and $10 for others. UMass-Boston also runs harbor cruises that leave from campus every Monday from June 2 through September 29. Monday cruises leave at noon and return at 1:15. As an added bonus, some of the cruises have professors from UMass-Boston as guest speakers. The price is pretty cheap, too. It's free with a UMass ID and $5 for others. Time's running short, as is the daylight, this summer, but check it out while you can. Click here for more information on the harbor tours run by UMass-Boston. I just finished reading The Paradise of All These Parts, a new book by John Hanson Mitchell. It's a really interesting new book on the natural history of Boston, a topic that the author notes is one that has been sparsely covered. Geography is such a major factor in the unfolding of human history (think how many wars have been fought over land, access to seaports, etc. ), and Boston is no different. Mitchell then sets out to educate the reader on the city's actual nature of the place. His narrative is part travelogue, part history, part nature lesson. At times it gets repetitive with certain facts that pop up in multiple chapters, but it's a good read. The author uses visits to downtown Boston, East Boston, Route 128, Franklin Park, Blue Hill (I hadn't known this was the highest point within 10 miles of the coast along the Atlantic seaboard), the Fenway Victory Gardens (the only extant victory garden in the U.S.), and Boston Harbor, among other places, to help advance the narrative. Mitchell tells the story of how Native Americans and Puritans approached nature in very different ways, with the Puritans viewing the wilderness they discovered in America as a foreboding place to be feared and conquered, and how those attitudes carry on to this very day. I only wish I had more knowledge of flowers and birds, so that when Mitchell names particular species, I could better visualize. 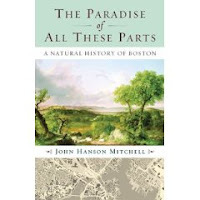 The book is not a tome solely focused on flora and fauna; there is discussion of the city's climate, urban planning, and history, which Mitchell talks about to make the case that the geography of the city influenced many historical events (even the witch hysteria in 1692) and to show how man has dramatically altered the natural surroundings of Boston. For example, Mitchell describes the menus of Locke-Ober and the old Taft 's Hotel in Winthrop, which were filled with many shorebirds in the early 1900s, reflecting their prevalence around the city back then. If you want to read a different take on the evolution of Boston, check out The Paradise of All These Parts.